The business card has long been a staple in business networking, but custom business card maker, Moo is using NFC to create cards like never before. As reported by GigaOM.com, Moo is producing paper business cards that house an NFC tag. While sending data between phones using NFC has been around for some time now, the advantage to using a paper business card actually simplifies the process. By eliminating any and all button pressing, and beaming relevant information directly to a smart phone or other NFC-enabled device, a business can quickly, easily and inventively network with customers and colleagues. 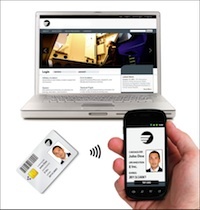 Not only can the NFC-enabled cards pass information on to a phone, but they can also tell the phone what to do with information, for example opening a web browser to view a webpage. Of concern to anyone handing out a business card is whether or not the recipient will actually keep the card, or simply throw it away. With Moo’s business card, there may be a possibility to add a phone number directly to a contacts list upon interacting with the NFC tag, effectively saving a phone number or email address directly to the receiver’s contacts with no effort on the part of the recipient. Moo states that the NFC tags can be reprogrammed at any time should the contact info or other data change. See the full GigaOM.com article here, and view Moo’s NFC-enabled business cards here.